In case you haven’t heard, there’s a comet now visible in the northern hemisphere just after sunset. This is one of those cases where, with a bit of effort and luck with the weather, you can take a great photo of an astronomical object without much more than just a camera and a tripod. Point and shoot cameras generally have a program mode that will let you control the exposure length and ISO. While you might be able to make out the comet in a photo taken in automatic mode, it’s worth taking a few minutes to understand how to use the program mode – with a little practice, you can get a much more satisfying result. For a DSLR, manual mode is the way to go. For a primer on all the different manual exposure settings for astrophotography, see Jerry Lodriguss’ Astropix website, in particular the excerpt from his book, A Beginner’s Guide to DSLR Astrophotography that talks about DSLR Camera Settings for Astrophotography. If you take a long exposure photo of the stars from a fixed camera, after a while the stars becomes streaks. An easy way to avoid this is to shorten your exposure time multiplied by the focal length of your lens to less than 400. For example, if you have a 50mm lens, you can take about an 8 second exposure without noticeable star trails. Some people call this the rule of 600, but in my experience, the stars exhibit too much streaking when using this target. Update 3/17 – The photos above were taken at a 250mm focal length with a 6 second exposure. This definitely adds some drift, but also helps an otherwise faint comet stand out a little better. The one thing to know about F-stops is, the faster (smaller the number), the better. Simply put, a smaller F-stop means more light gets to the image sensor. If you can set the f-stop lower, you’ll capture more detail in the same exposure time. If you have a zoom lens, even on your point and shoot, typically zooming out (shorter focal length) also results in a shorter f-stop. You capture a larger area of sky, with more starlight hitting the sensor, and because of the 400 rule, you can also take a longer exposure. Don’t even think of trying to take a long exposure photo while holding the camera – your hands just aren’t that steady. In fact, just the vibration caused by pressing the shutter button can cause streaks instead of stars, and the only streak you want to see is the tail on the comet. Fortunately just about every digital camera includes a 2 second or 10 second delay timer. Look in the camera manual to learn how to set this. Another option for some cameras is a remote shutter release. If you have one, use it. If you don’t, use the delay timer. If you have a DSLR, you also need to worry about mirror shake. Typically when you snap a photo with a DSLR, the mirror that sits in front of the sensor to give you the preview in the finder quickly flips up, which can cause the camera to shudder briefly. You can eliminate this by using the Live View mode or by setting the mirror lockup feature. Again, you’ll need to look in the manual for how to set this on your camera model. A lens hood is a simple and cheap way to help prevent stray light. The importance of this is magnified significantly when taking long exposures of the stars. If you are anywhere near a city, or just a stray light source, a lens hood will help cut down the bright background and minimize any particular hot spots on the image from a nearby streetlight or passing car. If you don’t have a lens hood, or you have a point and shoot that won’t accept one, you can also just shield the camera from any specific light source with a hat, blanket, or your body. A lens hood also makes a fun and simple DIY project. Just remember that you want to make the interior of the hood as dark and non-reflective as possible. If you do capture an image of Pan-STARRS, please share it with me on Facebook or Twitter! 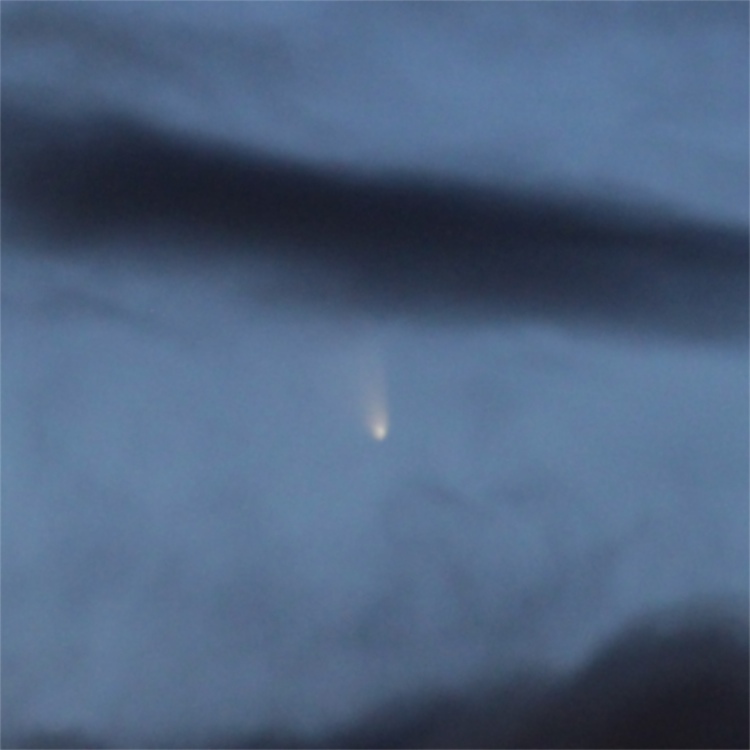 One Response to "Photographing Comet Pan-STARRS"